Percy’s parents, James and Mary Jenkin lived at Lower Downgate with their four daughters and five sons, most of whom who were born there and all baptised, either at home or Downgate Chapel, as Bible Christians. James was a miner although a few years later, he was recorded as being an invalid. That didn’t stop his eldest son George working in the mines too. Next in the family was Alfred who joined the Territorial Force. Then came Ephraim who joined the Royal Navy and was a stoker, first class, on HMS Vivid. Percy was next and he went to work for Mr. Lawry Rickard as a live-in waggonner at Manaton. The youngest brother Stanley got work at Trewassick for Mr. Nicholas Coad. He lived in, and looked after their cattle.Ephraim was invalided out of the Navy in May 1913 with TB and died two years later. When war came, Stanley joined the Royal Navy too, and served as an Able Seaman on HMS Defence. Alfred was invalided out after five years’ service. Percy enlisted in the Duke of Cornwall’s Light Infantry at Launceston on 5th December 1914. Initially he joined the 9th battalion at Falmouth but had transferred to the 7th by the time he had landed in Boulogne on 27th October 1915. From there, they moved to the front line around Armentieres where preparations for the Battle of the Somme were underway. His battalion had to maintain the trench system, which was prone to collapse due to the constant wet weather. There were only a few minor skirmishes with the enemy but they would have been under the extremely vigilant gaze of German snipers. On 22nd December, Percy was shot through the head and killed. A poignant newspaper report dated 15th January 1916 tells us: “It is understood that Private Jenkin had been in the trenches for nearly six weeks and had obtained leave to go on a journey of one mile to procure and despatch a Xmas greeting card for a little friend of his at Golberdon. The card, accompanied by a letter to the child’s parents, intimating that he was in good health, was dated on the day of his death. So it is assumed that on his return to the trenches he was killed. Private Jenkin will be greatly missed and his genial disposition won him high esteem and many friends”. On the 31st May 1916, during the Battle of Jutland, Stanley’s ship HMS Defence was shelled by several German battleships which detonated her rear magazine. She sank following the subsequent explosion killing all her 903 officers and men, including Stanley. 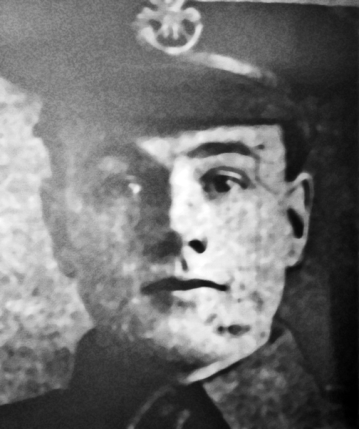 The Jenkin family had now lost three sons in a year and by now eldest brother George had also enlisted in the DCLI. The family would have had telegrams simply informing them of the death of their sons. Later, a second telegram from the War Office would settle any money owed and the post office from where this could be collected. Percy had left his effects to his brother and sole legatee, Alfred. He received the sum of £5 14s 10p (worth approximately £500 today) on 25th February 1916, comprised of £2 4s 10p cash and £3 10s War Gratuity. Private Percy Jenkin was buried in the nearby Y Farm military cemetery, Bois-Grenier. His grave is marked by a Portland stone headstone erected by the then Imperial War Graves Commission, now the Commonwealth War Graves Commission. The same headstone is used for all, irrespective of rank or country of origin of what was then the British Empire. His headstone records his name rank serial number, regiment and date of death, but there is no personal tribute. Relatives could choose their own words, providing it was suitably tasteful or choose from a menu of texts written by Rudyard Kipling whose own son was killed in WW1. Perhaps Percy’s family couldn’t afford the fee of six shillings, although the Commission did waive the fee in some circumstances. The cemetery is at a T junction on a single track country road, enclosed by a neatly clipped hornbeam hedge with a good crop of barley growing right up to the hedge. Next year it could be sugar beet, wheat, maize or potatoes. They are literally in “some corner of a foreign field, that is for ever England”. The graves of Indian soldiers are together, separated from the main cemetery by a low brick wall. Nearby headstones at Y Farm mark the graves of “A Soldier of the Great War – Known to God”. Others with no name may have their rank identified and some their regiment too. There is no coffin sized plot in front of each headstone, only a simple planted border. One can only speculate about what human remains lie buried beneath. Many were killed by shell fire. Almost half of the graves in this cemetery were moved here after the Armistice. Other temporary graves were destroyed by subsequent military action. Countless other corpses were enveloped by the ever present mud of the battlefield and few were ever found. The planting at all the many Commonwealth War Grave Commission cemeteries is designed to reflect the tranquillity of an English country garden (roses, neatly mown and edged grass) which perhaps may bring some comfort to visiting relatives but visitors to Y Farm seem to be few. 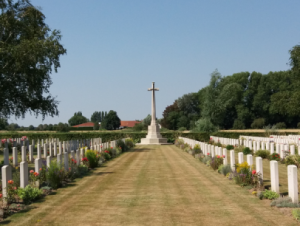 School parties, maybe remembering former pupils or choirs or rugby clubs remembering former members tend to visit the memorials at Thiepval and the Menin Gate or the massive cemetery at Tyne Cot. Cyclists with matching T shirts on their London – Battlefields memorial tour don’t come this way. There is no visitor centre explaining the events of 100 years ago and role that those who are commemorated here played in our history. But some do come to Y farm. The visitor book here reveals tributes to soldiers from New Zealand and Australia from their descendants. Another visitor is a serving British soldier who was re-visiting to pay his respects. He had attended the burial of the remains of a soldier discovered three years earlier. For the CWGC, this is a regular occurrence. This landscape is marked for ever by conflict from 100 years ago but this is hidden from the casual observer by a few inches of modern farming. They are all buried with the same respect given to their comrades who fell a century before. Researched and written by David Skelton. Thank you to Deri Parsons for some of the information in this article.